Growing up, I was fortunate enough to be surrounded by cakes. My Mom, Grandma, aunts ... all had sweet 'teeth' and loved to bake. Well, maybe not Mom so much. But one thing she knows well ... where to find the most amazing cakes in town. We got used to a certain style of ... er... Menadonese and Dutch crossover type of cake ... and that is one that involved light creamy genoise-like sponges (Menadonese) sandwiched with vla (Dutch), a custard made with eggs, sugar and milk. A few years ago, I discovered that the Dutch vla is one and the same as the French crème pâtissière, or Crème Pât, as many bakers call it. While crème pât is amazing in tarts, eclairs, trifles and with puddings, its light and creamy texture won't hold up in a tall and heavy cake. Although we did have much success in using it for the quad's birthday as you can see here. 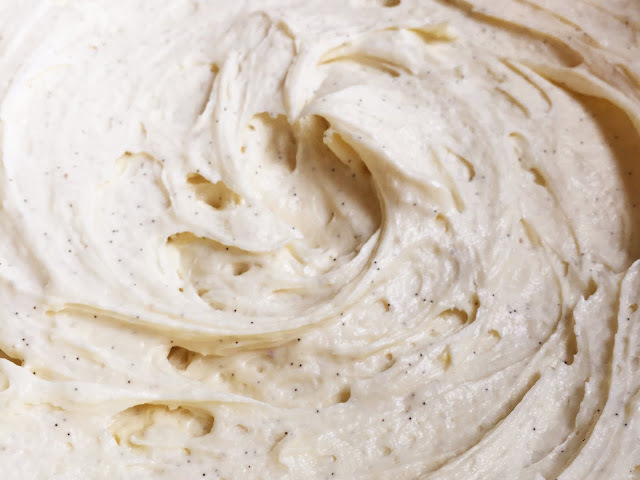 Then I came across mousseline, and I thought it would be amazing ... since it had crème pât's rich and custard-like taste that I was gunning for, coupled with the sturdiness of a buttercream. Sold! And since, for our anniversary, we were making our Magnum Chocolate Cavendish cake, mousseline would be ideal as a filling, it would go so well with the bananas! This recipe makes enough mousseline to sandwich a three layer 9 inch cake. Or two dozen (cupcake sized) tarts. 1. Prepare a small baking dish or Pyrex container, and keep the Saran wrap handy next to it. 2. In a medium sized saucepan, measure the milk and scrape the fabulous contents of the vanilla pods into the milk. Place the spent pods in the milk anyway, for good measure. 3. On a medium flame, heat until it comes to a soft simmer. We don't need this to boil over. 4. In a small bowl, combine the flour, corn starch and salt and whisk to combine. 5. In a medium bowl, whisk (sure you can use the same whisk, and, no ... you don't need to wash it first) the yolks with the sugar until pale. Some elbow grease required. 6. Whisk the dry ingredients into the egg mixture until smooth and well incorporated. 7. By now the milk will have come to a frothy, almost boiling stage ... discard the vanilla pods. 8. Turn the flame to its lowest, and pour a ladle or two of milk to the egg mixture, whisking vigorously to combine. 9. Now pour the egg mixture into the saucepan. Some more elbow grease required, preferably someone else's elbow! 10. Turn up the heat to medium and keep whisking (taking care the edges or corners of the saucepan are scraped) until you notice a burp or two erupting from within the depths of the custard. 11. Transfer this into the prepared pan and immediately cover with the Saran wrap to prevent a crust building up on the surface. Congratulations! You have just made crème pâtissière. But we are making creme mousseline ... so carry on. Yes... this is where the butter comes in. 12. When cooled to room temperature, place in the bowl of a stand mixer with the whisk attachment. 13. 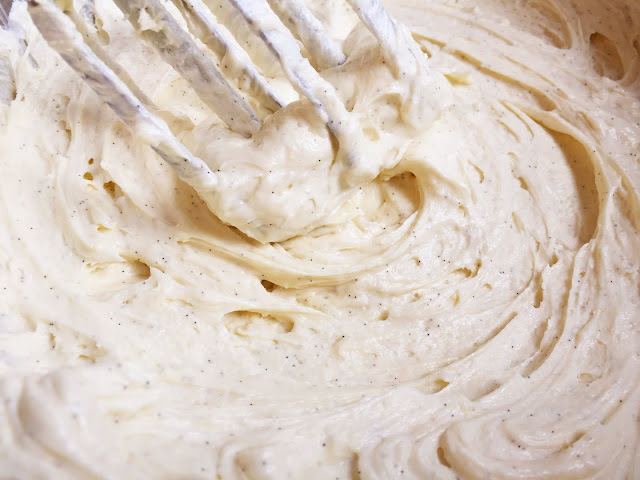 The crème pât will have thickened and set, but not to worry, a minute or two under the whisk will return it to its smooth and malleable form. 14. Introduce a chunk of butter, and allow it to fully disappear before adding the next chunk. 15. When all the butter has been added, you can add a tablespoon or two of rum, Grand Marnier or kirsch to flavour your mousseline. 16. Contain and cover with Saran wrap on the surface, up to 2 days in the refrigerator, or use immediately. You now have a smooth, velvety and rich custard buttercream to make fraisiers, mille feuilles, and to sandwich your cake layers.